Venerable Father John Sullivan, S.J. Two Holy Irish Jesuits: Father Willie Doyle middle in the back row with Fr John Sullivan to his left. Ordained together with Father Willie Doyle, S.J. The Venerable John Sullivan, S.J. went from being a successful Protestant barrister — and the best–dressed man in Georgian Dublin society — to being the humblest and most prayerful of priests with a particular gift for healing the sick. Friday last, 7 November 2014, Pope Francis signed a decree proclaiming the saintly Irish Jesuit’s heroic virtue. Father Sullivan was ordained a priest together with Father Willie Doyle, S.J. on 28 July 1907. For a biography of the new Irish Venerable, go here. Father John Sullivan often blessed the sick using his vow crucifix; today the crucifix is kept in St. Francis Xavier’s Church, Gardiner Street, where it still used to bless the sick who seek Father Sullivan’s intercession. Although a Jesuit, Father Sullivan was, in fact, doing what Benedictine monks have done for centuries in giving the powerful “Blessing of Saint Maurus“. The number of cures attributed to Father John Sullivan both during his lifetime and after his death is impressive. When asked to intercede for the sick, Father Sullivan often said, “I will read an Office for him and offer Mass for him tomorrow morning, and he will be alright”. How impressive was the confidence of this Jesuit in the impetratory prayer of the Church given us in the Divine Office and Mass! At other times he would recommend the simple, but efficacious practice, of three Hail Marys daily in honour of Our Lady’s Immaculate Conception, or prayer to a particular saint. Father John Sullivan devoted himself selflessly to caring for the bodies and souls of the sick. He visited them in their homes, both rich and poor, and was tireless in comforting the sick in hospitals. He consoled afflicted people with letters and traveled by bicycle and on foot to give them his blessing. 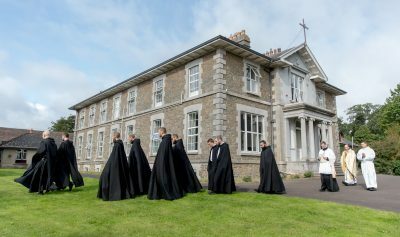 Towards the end of his life it was not uncommon to see a queue of automobiles outside the church at Clongowes, in which the sick had been brought to receive Father John’s blessing. One wonders what was greater: the faith of the people in the intercession of a holy priest, or the faith of the priest in the power of prayer to obtain even miracles. Venerable Father John Sullivan, pray for us.